Ausflam Fire Systems offers a variety of modern, architecturally designed fire rated windows that comply with Australian standards by achieving the appropriate fire resistant level. A fire window is a passive fire protection system that is designed to prevent fire, smoke and heat by isolation and containment of a fire from one segment of a building to another with the benefits of our architecural designs that keep your buildings appearance either modern or heritage, as we will make your window to match your building. All of our window frames are fully welded with a powder coated finish of your requirement, the windows are designed to provide a neat, impeccable appearance as all of our windows maintain our high standard of quality, and are manufactured to ensure they meet all fire standards to the BCA. These windows are ideally installed at external locations. These windows only provide a protection from the spread of fire, as the locations of these windows pose no risk of the flame spreading or injury to people due to intensive heat emission. These windows must not be used in areas where there is human traffic such as fire escapes, or any location where people can be exposed to serious levels of heat radiation. These windows are an excellent choice for use in fire walls, corridors, fire escapes, external building walls or anywhere protection against both flames and heat is required. An insulated fire window is needed where the location of the window has a high amount of foot traffic. Insulated fire windows provide a protection against the spread of fire, heat radiation and smoke, as the locations of these windows pose a higher risk to people’s lives and properties. If you are in need of a fire rated window system for your building or have a questions about our fire rated windows, please do not hesitate to contact us & speak with a professional today! Fire rated windows are essential for any building to ensure safety of people who live and work there. If a window breaks during a fire emergency, it allows a sudden burst of fresh air and oxygen into the building. Fire needs constant supply of oxygen to keep burning and the sudden burst of air often causes the fire to explode and burn more rapidly. Normal windows also allow the fire and fumes to spread quickly to other unaffected parts of the buildings. Commercial settings bear a greater risk of human fatalities due to fire, because of the high volume of human traffic inside the building. Fire safety measures must be checked regularly to ensure safety for your business. And if you don’t have good fire safety windows installed, it is best to quickly contact a reputed fire protection system expert before an unexpected state of emergency arises at your place. In Sydney, you can rely on us for any fire protection system installation, as Ausflam Fire Systems is one of the most reputed and reliable fire protection system companies in the region. We offer a range of modern and architecturally designed fire protection windows that comply with Australian standards of appropriate fire resistance. – Non Insulated Fire Rated Safety Windows- Non insulated windows are designed only for protection against spread of fire and not against the smoke and heat. High levels of heat radiations and toxic fumes are highly dangerous and capable of claiming human lives. Thus, non insulated fire windows are ideal only for sections of buildings, where there is no human traffic. – Insulated Fire Rated Safety Windows- Insulated widows are specially designed and insulated to offer protection against spread of fire, heat radiation and smoke. These insulated windows are therefore ideal for fire walls, external walls, fire escapes, corridors and every other sections of the building that can pose risk to human lives. The safety windows along with our other products and services ensure maximum safety and a peaceful working atmosphere for all the people employed in your organisation. With this complete set of fire safety services, we make sure that there isn’t a single open access, for fire to spread and affect other parts of your building. Ausflam Fire Systems has over 25 years of experience in the fire protection industry. We offer every customer friendly service, ensuring high standards of quality and perfection on all or products. We also conduct annual fire safety inspections and provide compliance certification to ensure fire safety in the premises. 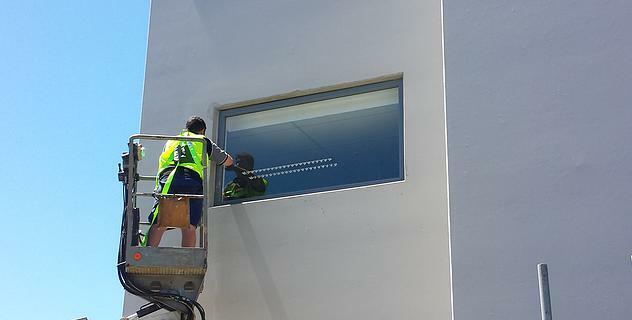 If you require any of our services, including fire rated windows, in Sydney, simply give us a call on 02 9725 3561 and we’ll be glad to discuss your requirements. Alternatively, you can also choose to contact us by submitting the Online Contact Us Form and our expert will address your email and contact you as quickly as possible.